Superhero Movies Are big business and have been for some time now. The catch is that they have to be done right. As the tragic story of what has happened to Warner Brothers and DC films (just look at the results of their Justice League movie,) will show you, the general movie going audience is not jumping at every superhero movie simply because it fits in the genre. Quality does matter and nobody knows that better than Marvel, the biggest and best name in the business. With that in mind, here’s a look at what’s coming up this year. This movie looks incredible. Between the technology, the action, and visual look of this film, this thing really seems like it will take cool to a new level. Everyone about Wakanda, the fictional country where this movie takes place, inspires curiosity and amazement. This country has stayed hidden from the world, and we’re about to find out both why and how. And the Black Panther himself looks to be an incredible superhero. Ryan Coogler is the perfect director to be making this movie, coming off Creed, the incredible accomplishment that brought the Rocky movies back, in a whole new light. What he does with Black Panther will mostly be an even bigger accomplishment. The movie we’ve all been waiting for. This is going to be the biggest thing in the MCU. It brings everyone together. The Avengers. The Guardians of the Galaxy. Spider Man, Doctor Strange, Black Panther. Everyone who has ever been in a Marvel movie. 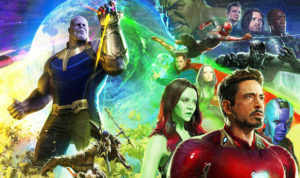 And its putting them all up against Thanos, the biggest villain we’ve had to date. If anyone can juggle this massive story it’s the Russo Brothers, (look at what they did with Captain America Civil War.) This one will be huge. Epic. Can’t wait! The movie will be awesome. What’s great about this sequel is that you know it’s going to take even more chances than the first movie did, and really push the hard R rating even further. On top of that, in the two years since the first movie, superhero films have come a long way and really carved out their own spot in popular culture. Expect many more references to that, including jokes about Marvel characters, DC characters, as well as the X-Men, (in the first movie, we really only got jokes about the X-Men.) But Deadpool 2 has earned it’s credibility with the first film, and now the floodgates are opened. Sure. The first one was good. This next one should also be good. Marvel can do no wrong. Paul Rudd is perfect for this role, which is the most comedic and light-hearted of all Marvel films. The same director, Peyton Reed, is back. It’s amazing how Marvel took this guy from movies like Bring It On, and transformed him into a blockbuster caliber director, (then again, look what they did with the Russo Brothers, from TV shows like Community to Avengers Infinity War.) Ant Man and the Wasp will feature lots of banter between Paul Rudd and Evangeline Lily, and the supporting characters from the original film are all back as well (everyone from Michael Douglas to Michael Pena.) This should be great fun. You would think this movie would be amazing, based on the cast. Tom Hardy and Michele Williams are both dynamos of the silver screen. But something just isn’t hitting right in the trailers. 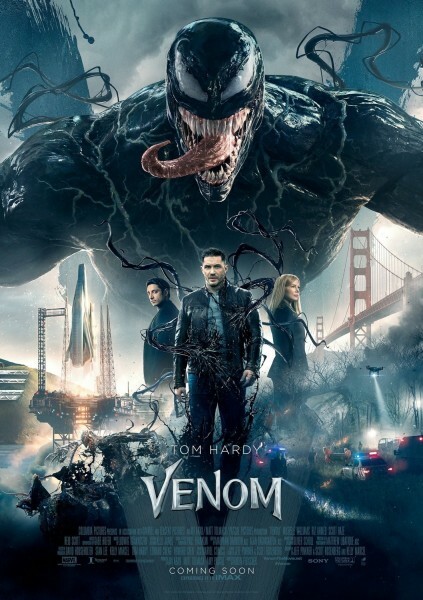 They’re not showing us enough Venom, and what they are showing doesn’t look great. It’s a tough situation, because you don’t want to overdo it and show us too much (like the DC movies always do, going back to showing us Doomsday in the trailers for Batman Vs Superman,) but you also want to show us enough that we think the movie looks really cool. Show us the villain. Basically follow the Marvel formula. They always show us who the villain will be, but they never show us all the technology and cool ideas that will be involved. Venom is an awesome character, but this movie might have its hands tied about not being able to use or reference Spider Man. That’s due to the Sony-Marvel deal. Hopefully Tom Holland makes an appearance. The director, Ruben Fleitcher, isn’t great. This is the guy who made Gangster Squad and 30 Minutes or Less. He also made Zombieland, which was great. Here’s hoping this movie is more like that film than those others. I don’t know. James Wan is a good director, but considering how bad Justice League was, it’s hard to be excited about this. It might be good, but that’s iffy at best. On the plus side, any movie that takes us into another world, (like the first Thor movie,) has got some great potential. In this one, the world is Atlantis. It’s underwater. Think the ocean world in the Little Mermaid. Sounds pretty neat. Characters ride on sea horses. At the very least, this movie should be visually stunning. The cast is just okay. Jason Mamoa, Amber Heard, and Patrick Wilson. No standouts there, but that might be a good thing. After all standouts often come with baggage and false expectations (just look at the Tom Cruise Mummy movie.) With this one, anything can happen.